White Train Surrounded by Concrete, Stainless Steel and tarmac. November 2018, Anaheim, California: I made this trailing view of Metrolink train 661 with F59PH 854 working northward amidst lots of transportation infrastructure. Exposed digitally with my FujiFilm XT1. Inky Gloom and Artificial Light: Metrolink at Riverside California. I exposed these views using my FujiFilm XT1 with 12mm Zeiss Touit lens. Key to my success was the high ISO setting (ISO 5000) and auto white balance setting that adjusted and balanced myriad artificial light sources. Lacking a tripod, I positioned and steadied the camera on the half open ‘dutch door’ of private passenger car Silver Splendor as it was paused across from the Metrolink train storage sidings in Riverside, California. My exposures were about 1/2 second at f2.8 (ISO 5000). To make the most of the photos, I imported the camera RAW files into Lightroom and adjusted highlights and shadows to make for more pleasing final images. November 17, 2018, Riverside, California. Fullerton by Day: Metrolink from LA. On November 17, 2018, I made this view of Metrolink train 662 eastbound on the old Santa Fe at Fullerton, California. To make the most of the palm trees that line the platforms, I cross-lit the train, exposing from the north-side of footbridge over the line. Metrolink’s white locomotive hauling a mix of white and stainless-steel cars effectively reflect light on the shadow side of the train, which make for a more even exposure and help balance the photograph by compensating for the otherwise inky darkness of the high-sun shadows. These views are looking west . I used a telephoto lens that compresses the row of palms. Some seven hours after I made this image, I was back at Fullerton again. Stay tuned for my nocturnal views from the same station. 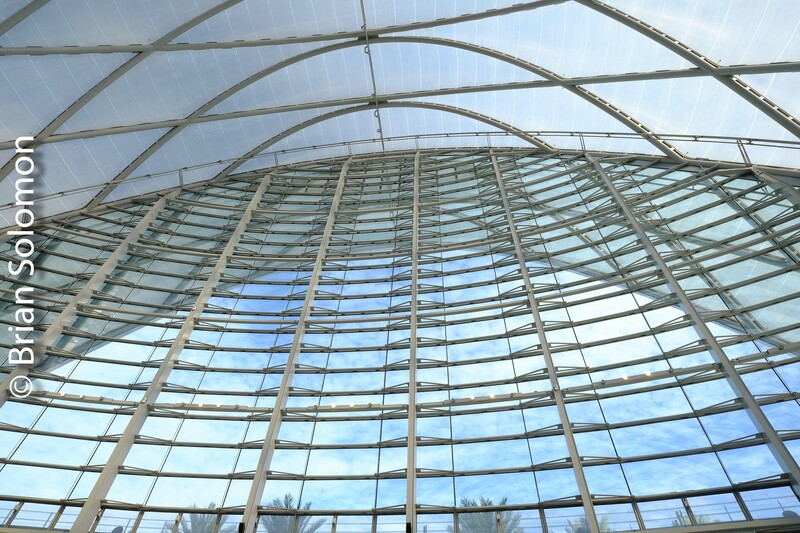 Palms, Sun and Glass: Anaheim Regional Transportation Intermodal Center. I prefer the term ‘Anaheim Station’. 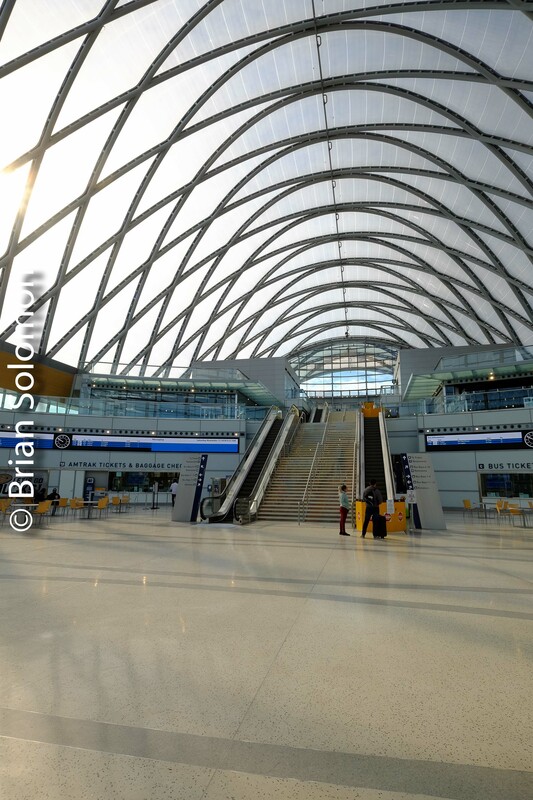 Last week, working with my FujiFilm XT1 with 12mm Zeiss Touit lens, I exposed these digital photos of one of California’s most modern, and most impressive railway stations. This is such an impressive looking building that I drove past it while I was trying to find it! Slightly diffused mid-morning sun made for nearly ideal lighting to make the most of this facility. Would front lighting make for a better photo? 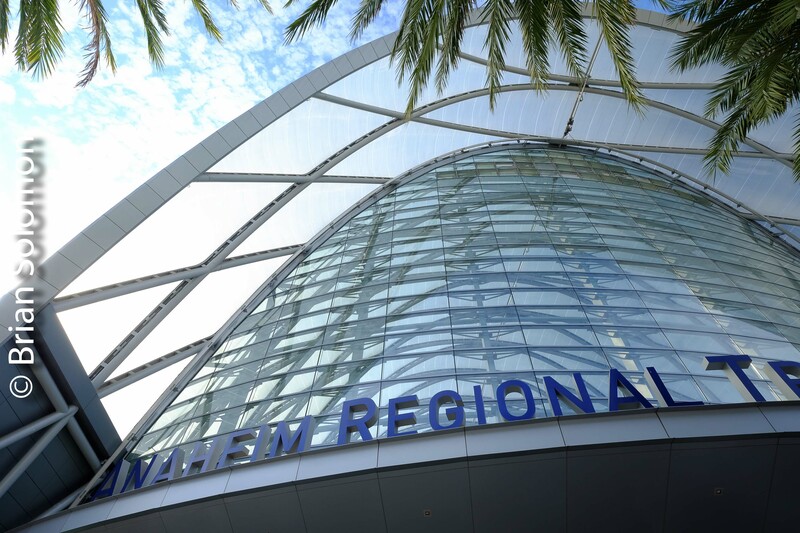 Anaheim Regional Transportation Intermodal Center is abbreviated ‘ARTIC’. Backlit diffused sun with overhead skylights made for a difficult exposure. View with a 12mm Touit lens. Footbridge to go from the station building to the Metrolink platforms. Amtrak Pacific Surfliner, train 1565, paused at Anaheim. 12mm Touit view. 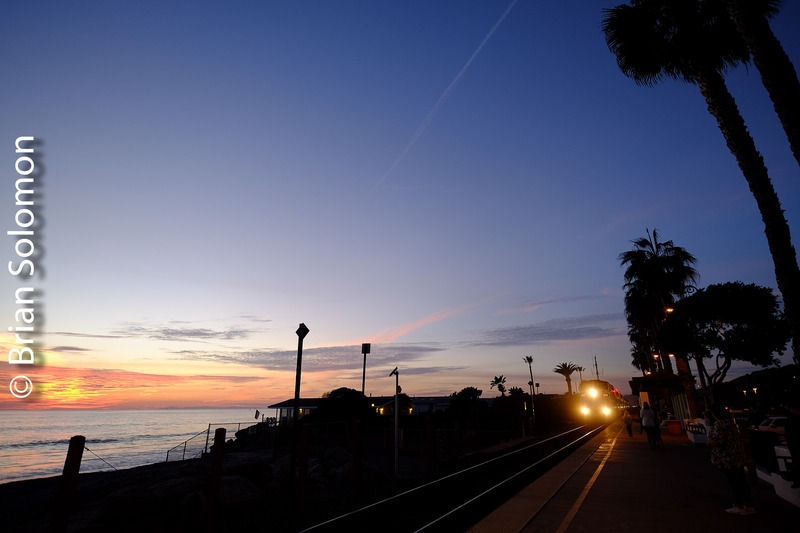 Last Friday, November 16, 2018, as the sun dropped near the horizon and a layer of cloud and haze filtered the light, I repositioned myself from San Clemente Pier, northward to the Metrolink Station at San Clemente, California. I selected my location in order to make photos of a southward, Oceanside-bound suburban train with the sun setting over the Pacific. Working with my FujiFilm XT1 fitted with a 12mm Zeiss Touit lens, I exposed several sunset silhouettes as the train arrived onto the station platform. To make the most of the sunset lighting, I exposed manually for the sky, allowing the locomotive and cars and other terrestrial objects to appear dark. 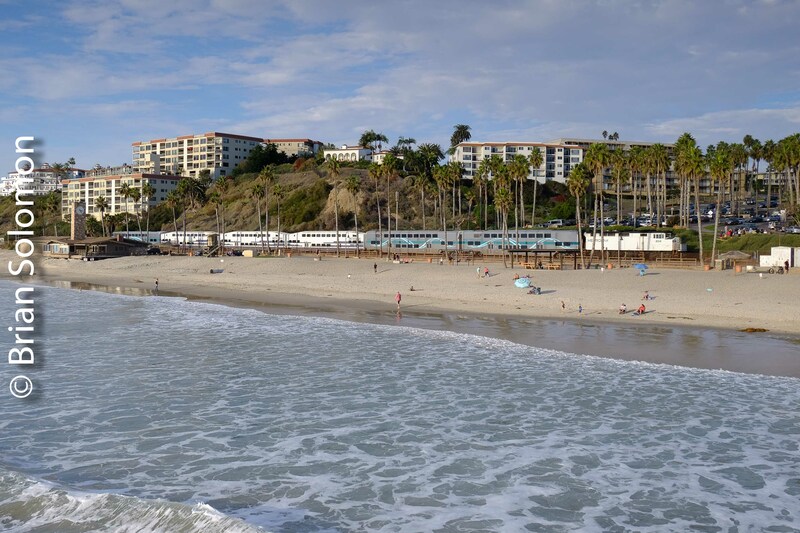 4 Views: Los Angeles Metrolink at San Clemente Pier, California. 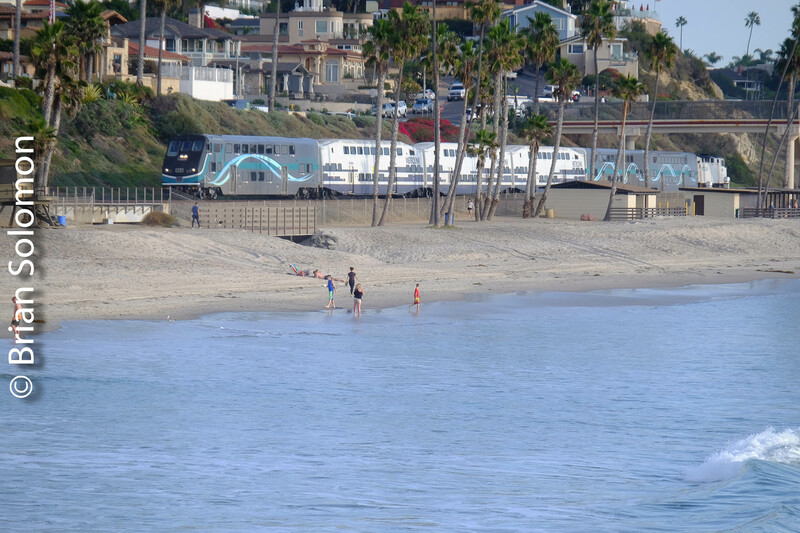 Just a few views of Metrolink trains on the old Santa Fe Surf Line at San Clemente, California. California evening sun, surf and palm trees make for a nice light in a pleasant setting. 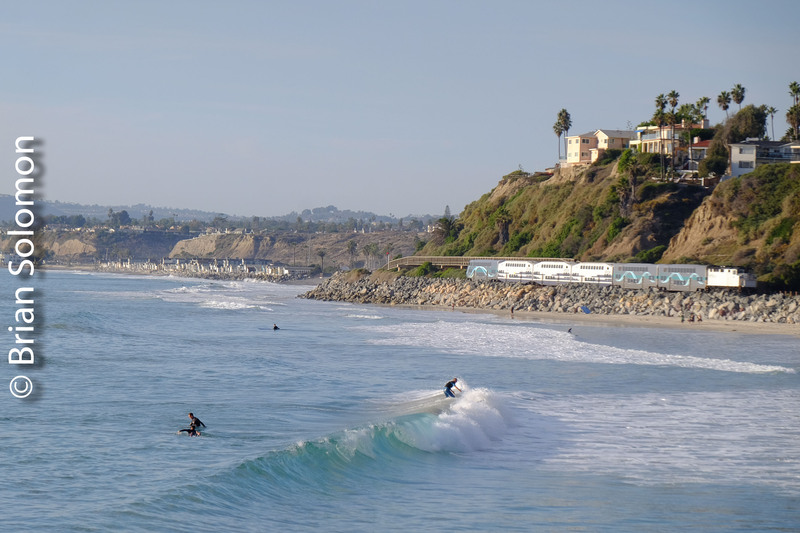 I exposed these photos from San Clemente Pier last Friday. Using an 18-135 zoom lens gave me the needed flexibility to adjust my field of view as the trains passed. Metrolink train 641 at San Clemente. 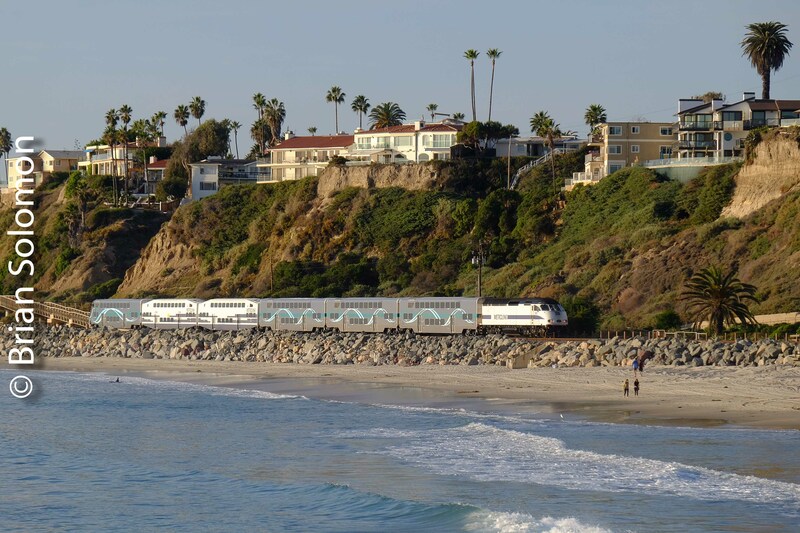 Los Angeles Metrolink train 641 at San Clemente, California. Los Angeles Metrolink train 609 at San Clemente, California. Sun on the old Southern Pacific Coast Line—July 28, 2016. Last summer, I spent a pleasant afternoon exploring the old Southern Pacific Coast Line between Simi Valley and Moorpark, California. At CP Madera, I ascended this cutting and made a series of digital photographs of passing passenger trains. This was not what I expected: an Amtrak ‘Cabbage’ (a former F40PH diesel converted as a cab-car with baggage compartment) and single-level Horizon cars with a Genesis diesel pushing at the back. Amtrak A790 was far cry from the typical Pacific Surfliner consist that features an F59PHI and Bilevel cars. File converted from a Camera RAW using Lightroom to adjust contrast and lighten shadow areas. Trailing view of Amtrak Pacific Surfline A790 at CP Madera, near Simi Valley, California. I made this photo with the camera set in the ‘Velvia’ colour profile. 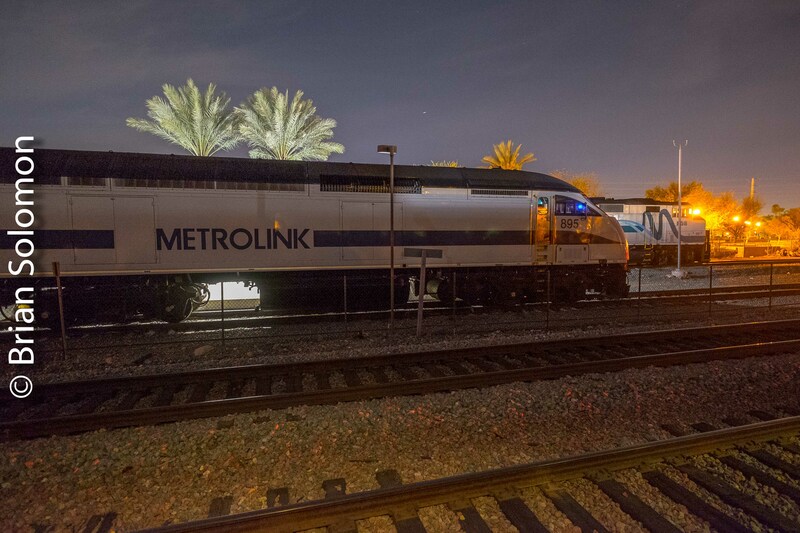 A few minutes after Amtrak A790 rolled past, Metrolink 117 from Los Angeles came the other way. Here I’ve used a telephoto perspective to make the most of the setting. As the train approached, I used the zoom lens, pulling back my focal length to a slight wide angle view. The view looking west into the evening sun was exceptionally contrasty. So in post processing I lightened the shadows, darkened the sky and lowered the contrast in a effort to produce a more pleasing image. Also, on site I’d shaded the front element of my lens with my notebook. If you look carefully, you can just see the fringe of my notebook cover in the sky. I’ve left this imperfection in, rather than crop it out, so that you can get a sense for what I was doing. 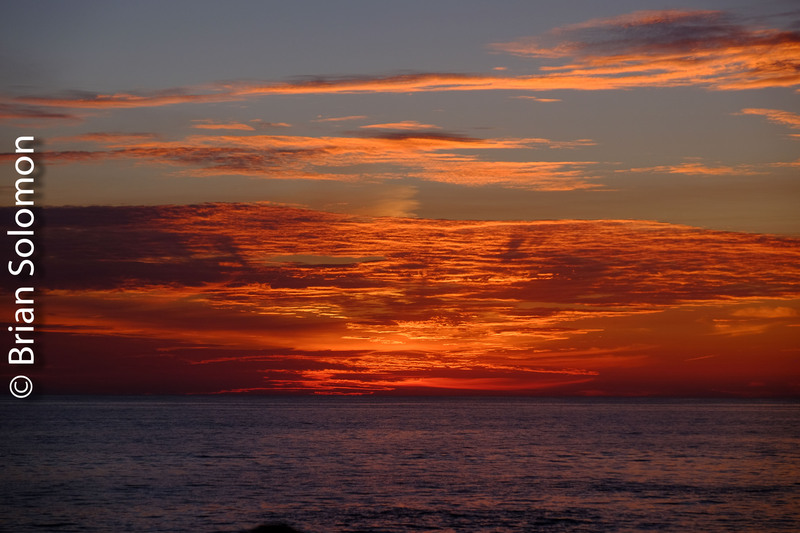 These were exposed using my Fujifilm XT1 with 18-135mm zoom lens. I calculated the light using the camera’s center weighted meter and set aperture and shutter speed settings manually. Although bright, exposures can be tricky, especially when dealing with flat white locomotives. Santa Ana, California—Ten Photos in 45 Minutes—August 2016. 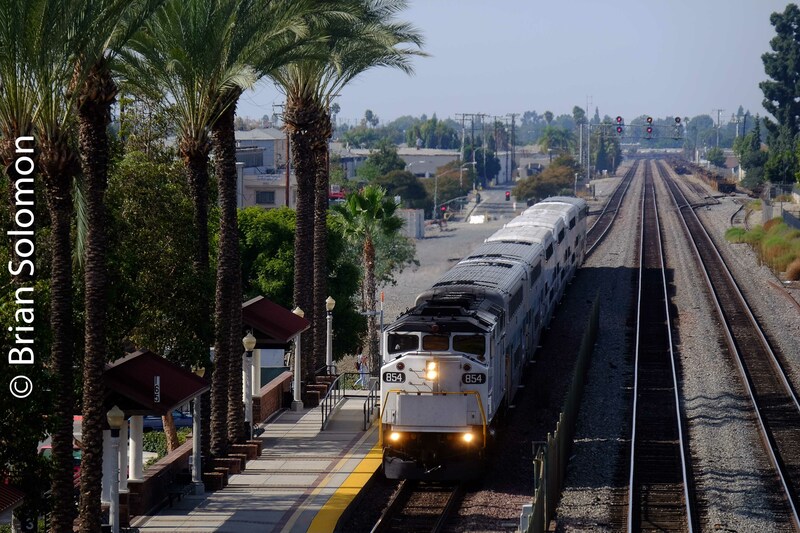 During one of my recent Metrolink blitzes, I rode from Los Angeles Union Station to Santa Ana where I changed for an Inland Empire-Orange County Line train running from Oceanside to San Bernardino. I timed this brief visit to coincide with a flurry of Amtrak and Metrolink trains. I had just 45 minutes to make images of this classic Santa Fe station having never previously explored here. I found Santa Ana to be an excellent mid-morning location. The footbridge is photographer friendly and the old Santa Fe building makes for a suitably California setting. The height of the bridge allows for both distant telephoto views as well as wide-angle down-on photos. I exposed these views digitally using my Lumix LX7 and FujiFilm XT1. I arrived on Metrolink train 600 from Los Angeles Union Station. I had enough time to walk to the headend and expose this view with my Lumix LX7 before the train departed. Metrolink 687 arrives behind a borrow BNSF AC4400CW. This framed view was exposed using my Lumix LX7. A Metrolink F59PHI works at the back of Los Angeles bound train number 687. Here my Fujinon 18-135mm lens gave me a nice view of the train and station from the footbridge. Metrolink 633 is among Metrolink’s services that doesn’t serve Los Angeles Union Station. This is a short-turn that runs from Laguna Niguel/Mission Viejo to Fullerton. By using my 18-135 zoom on my Fuji XT1 I was able to exposed a series of trailing photos of Metrolink 633 as it accelerated away from Santa Ana. This is a telephoto view of train 633 from the same vantage point as the photo above. 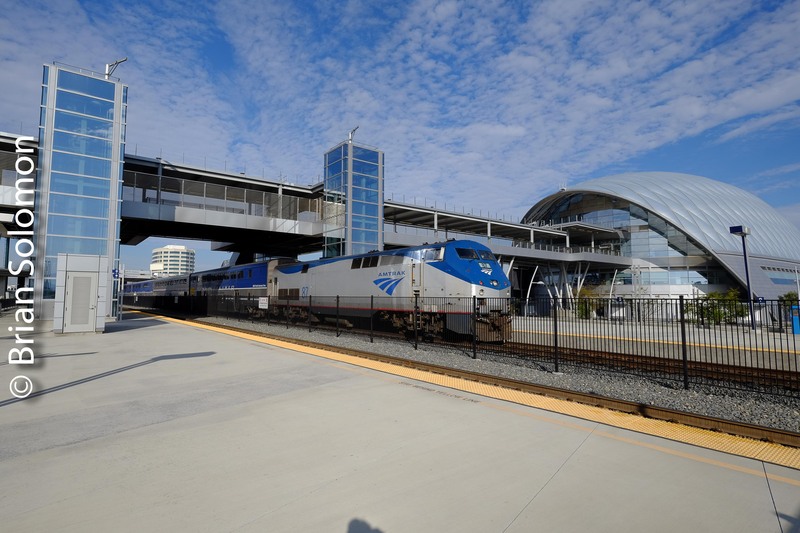 Metrolink’s timetable shows both of its services to Santa Ana as well as Amtrak’s Pacific Surfliner. A detailed view of the Santa Ana station exposed using my FujiFilm XT1. Amtrak 566 Pacific Surfliner slows for its station stop. Metrolink 802 will take me to San Bernardino. I arrived under partly cloudy skies and departed under a California blue dome. Happy days! 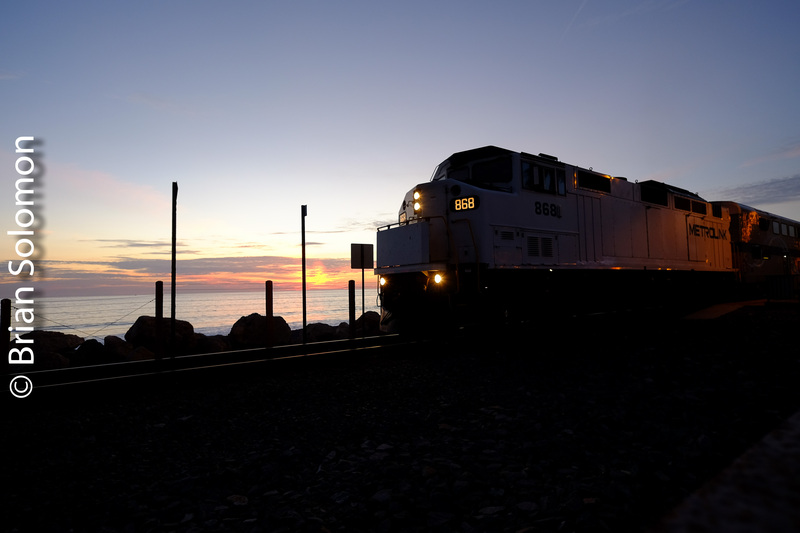 Photographing Passenger Trains on California’s Santa Susana Pass. Back in the day, Southern Pacific’s famed Daylight was often pictured crossing Santa Susana Pass—a scenic cleft in the rocks between Simi Valley and Chatsworth, California. Once a remote area, this is now hemmed in by suburban development, freeways and public parks. Riding Metrolink, I’d noted several potentially interesting locations on the west side of the pass (SP timetable west, today Union Pacific timetable north). Reviewing Google Maps, I found that views of the line should be accessible from Corriganville Park, located a little ways to the east of Simi Valley. So one afternoon last week, David Hegarty and I made an exploration of the area. There’s a flurry of Metrolink and Amtrak trains in the evening. We found some locations near CP Davis (location of a passing siding) with an aim to make images of BNSF GE-built AC4400CWs that have been working many Metrolink trains. A BNSF General Electric-built AC4400CW works Metrolink 118 near CP Davis on the west (north) side of Santa Susana Pass. A few of Metrolink’s F59PHI diesels have the full paint treatment completed with blue and aqua ribbons. It was nice to get this one working with a bit of scenery on train 117 from Los Angeles. Although not the prettiest locomotives, Metrolink’s boxy model F59PH diesels make for a bit of variety. Here train 119 is seen near tunnel 26. Amtrak Pacific Surfliner, train 790, featured a GE Genesis P42 instead of the Amtrak F59PH’s more commonly assigned to California services. The engine is at the back of the consist working in push-pull mode. I exposed these images with my FujiFilm X-T1 digital camera, but I also made a few color slides that will be processed at a later date. Taking a Spin on Los Angeles-area Metrolink. Metrolink is nearly a quarter century old, having commenced operations in 1992. Over the last couple of weeks I’ve enjoyed traveling and photographing the Los Angeles-area Metrolink. The comfortable coaches, variety of locomotives, and interesting route structure makes it one of the more interesting suburban railways in the United States. In addition to lines focused on Los Angeles Union Station are several non-radial routes/services, which makes Metrolink unusual among American commuter lines. All trains are diesel powered with double-deck cars. The newer Rotem-built cars are my favorite to travel in. Detail of a Rotem-built double deck. Using my Lumix LX7 (and other cameras), I’ve made dozens of images from the train, as well as interior views of the equipment, and of course views of the trains and stations. One of the older cars. Rolling along through suburban LA. Passengers board a morning train. Rolling toward Los Angeles Union Station behind a BNSF AC4400CW. BNSF local freight at San Bernardino. I made these views at Los Angeles Union Station the other morning featuring some of Metrolink’s Electro Motive Division-built F59PHIs. These locomotives were styled in accordance with mid-1990s General Motors automobile aesthetical considerations. Today, with two decades of hard service behind them they look like battle worn machines and reminded me of the Penn-Central E-units I used to see as a kid. Using my FujiFilm XT1, I made some detailed studies of several of these old machines. For this view I wanted to include the tower to the left of the station. To make the composition work, I used my Zeiss 12mm Tuoit, which had secondary effect of providing a suitable color palate for the scene. Notice the optical illusion at the very top of the frame that makes the edge of the photo seem skewed. Still using the Zeiss 12mm, I walked up close to the old F59PHI and made this slightly unusual perspective. A little bit of contrast control was needed in post processing. 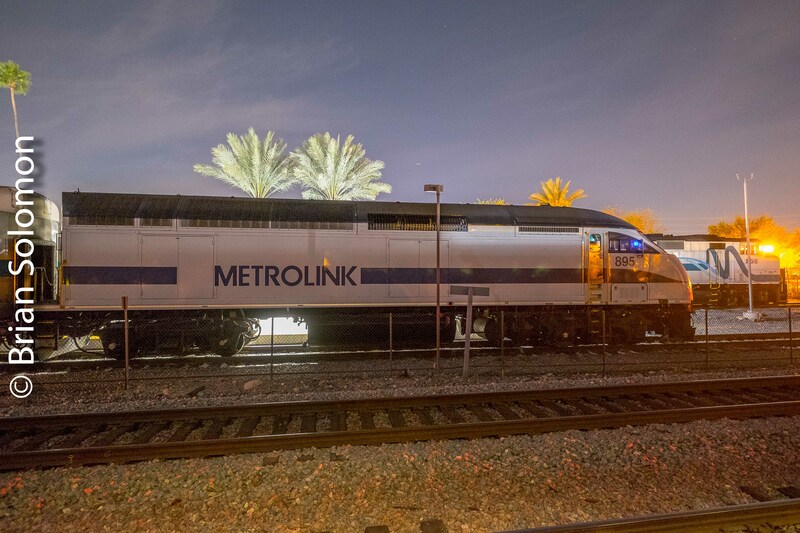 Metrolink 880 has evidence of a collision. The nose section is made of of fiberglass and designed to help protect the crew. Exposed with my Fujinon 18-135mm lens. Here’s a vertical format view made from the same angle. Which do you prefer? Nose comparison. I’ve always liked this sort of image where a locomotive’s shape is echoed. In the old days I’d do this sort of thing with E and F units. My new book Field Guide to Trains, Locomotives and Rolling Stock (published by Voyageur Press in 2016) features the F59PHI with an image of a Metrolink locomotive at Los Angeles Union Station in 2009. Tracking the Light Runs Daily! Metrolink 115 at Simi Valley, California; a difficult exposure. Here’s an exposure quandary. A bright white Metrolink F59PHI in blazing California afternoon sun against a varied background of trees and mountains..
Metrolink’s scheduled train 115 accelerates away from its Simi Valley station stop in July 2016. Why? Because the camera meter doesn’t know the locomotive is white, and if relying on many auto exposure settings, metering tends to over compensate as the white engine reached the center of the frame. On the flipside, the row of trees at the left could fool also the meter into compensating for the relative darkness and thus producing an image that is too light overall with the front of the engine grossly over exposed. Before the train comes into view, make a series of test meter readings while aiming a sunlit neutral portion of the scene such as the ballast. Then observe the relative difference in exposure between lighter and darker areas, make a test photo or two, and if your camera has a histogram check to ensure that the bulk of the exposure is in the center of the graph. Then set the camera manually based on this information. In my situation, I made a slight adjustment as the locomotive came into view to compensate for the bright white nose section. This meant I needed to stop down (see the aperture to let less light in) by about 1/3 of a stop. Here’s the Jpg of the train along side the camera’s EXIF data. The relevant fields show that the camera was set at ISO 200; shutter speed 1/500th of a second, and the lens was at f7.1. So why not f8? That would cause the trees to become too dark and the engine appear more gray than white. Here’s my closer view. I retained the same exposure setting. Dublin’s LUAS (not an acronym) is the name for the city’s modern light rail system. By contrast, the Los Angeles Union Station is now known by its initials LAUS. 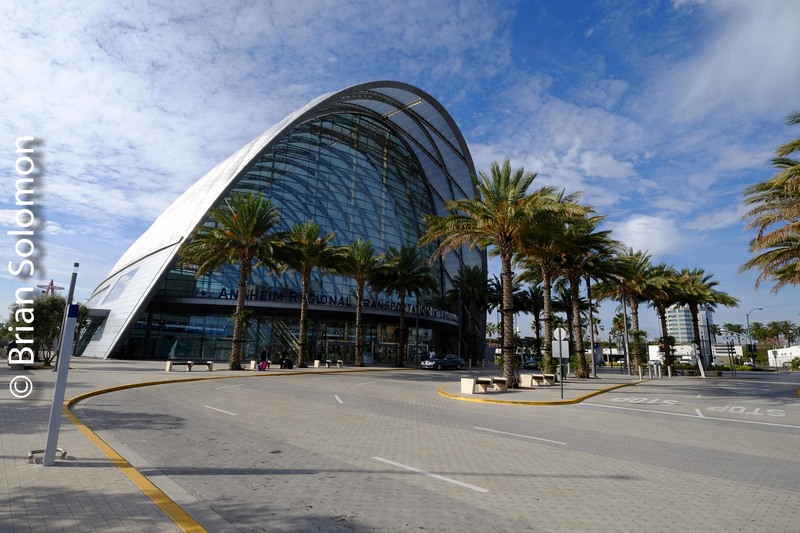 Historically, it was called the Los Angeles Union Passenger Terminal, and called LAUPT. I featured this great terminal in my recent book: Railway Depots, Stations and Terminals, published in 2015 by Voyageur Press. The other day I revisited the station and made my first digital photographs of the buildings and trains there. (A station is more than just a building or buildings). Los Angeles Union Passenger Terminal (LAUPT) was completed in May 1939. It is a rare example of an Art Deco era railway station and one of the few stations that opened during the streamlined era. It’s modern interpretation of the Spanish Mission style design is largely attributed to the LA-based architectural team of John and Donald Parkinson. Metrolink is a popular name used by modern urban passenger rail systems. As a follow-up from yesterday’s post, I’ve included more images from my Manchester visit earlier this month (August 2014). The present Metrolink colour scheme on the cars is a contrast from the 1990s-era trams that I experienced on my visit in 2000. Those were painted off-white with black and aqua-green stripes. While on this visit, I saw a few of the first generation trams stored at a depot, these no longer appeared to be in service. Too bad, it would be interesting to get photos of the old and new side by side. I found Manchester Metrolink convenient to travel on and easy to photograph. Tram frequencies were very good and for the most part the trams were well patronized, but not overly crowded. In my photography I tried to include the environment around Metrolink and not just focus on the railway. Among the more interesting places to make images was in the city centre where the trams run in the streets that were crowded with pedestrians. Here the Lumix LX7 is an ideal tool. The camera is inconspicuous and allowed me to get some dramatic angles without difficulty. A mix of bright sun and sluicing rain made for dramatic changes in the quality of light. Eccles. A burst of sun after a prolonged shower. A cafe in the Manchester City centre allowed me to get a bit of lunch and stay dry in between cloud bursts. While the sun is out in this image, minutes before it was gushing rain. The Lumix LX7 allowed me to get some low angle views to accentuate the damp streets and reflect the clouds in the windows of the tram. Crowds wait at Market Street in the Manchester City Centre. A bit of glint graces the back of an outbound tram near Manchester Piccadilly Station. Tomorrow: the second tram city in this story! Metrolink madness: What are you saying about the commuter chaos? LA Metrolink at rush hour. I exposed this Fullerton seen with my Canon EOS 3 with a 100mm f2.0 lens on Fujichrome slide film. In Spring 2008, I spent seven weeks in California working on my ‘Railroads of California’ book for Voyageur Press. I focused on elements of California railroading that I’d missed or had changed since I lived there in the early 1990s. At the end of May, I took Amtrak’s Coast Starlight from Oakland to Los Angeles. 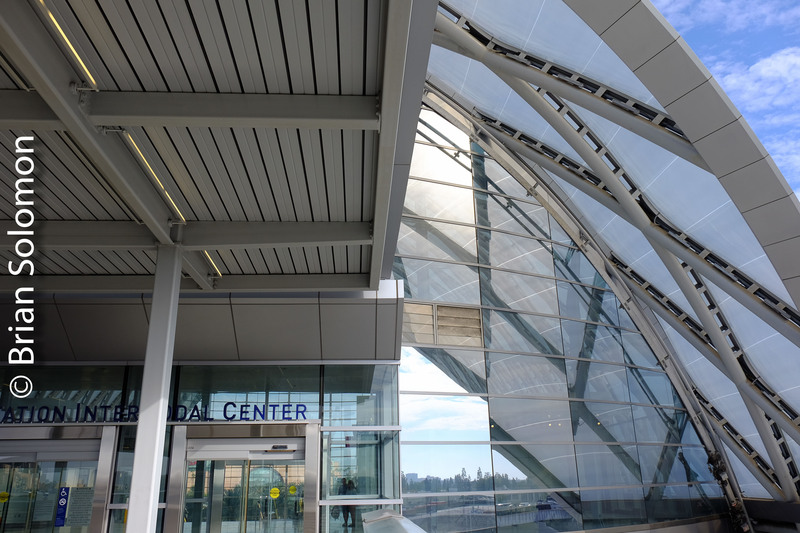 Among my projects was the Los Angeles Metrolink commuter rail system.Aiding my effort, Metrolink provided several comp-tickets. On this day, my cousin Stella and I traveled over several of Metrolink routes. I was delighted by the trains, which were air-conditioned and comfortable. I focused the evening’s efforts at Fullerton, a location that my father recommended to me. Several years earlier, he’d spent an afternoon waiting for Santa Fe 3751 (Baldwin-built 4-8-4 steam locomotive) that was working an excursion. 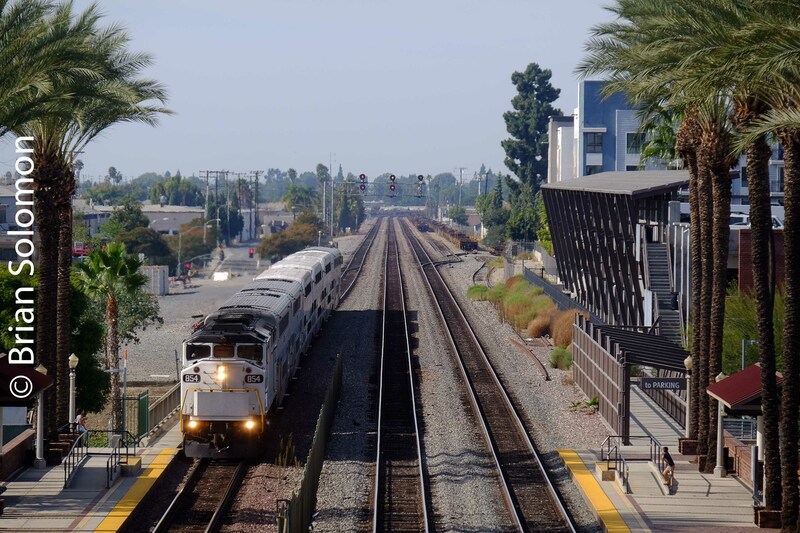 Fullerton is a busy place with three main tracks that host Metrolink, Amtrak, and BNSF trains. I exposed this image from the foot bridge as a Metrolink train paused for its station stop. Hazy LA-area smoggy sun makes for a nice soft light source, while backlighting offers good contrast for a high impact image.